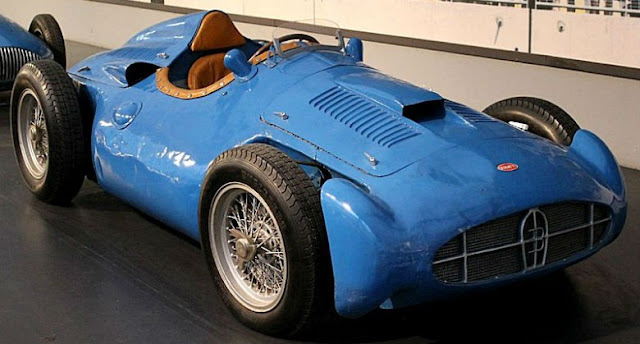 The Bugatti T251 was designed by Gioacchino Colombo. He had formerly worked for Ferrari. F1 cars of the era were typically front-engined - but Columbo's T251 broke with that tradition. Its straight-eight engine was placed behind the driver. The 5-speed Porsche gearbox - and final drive - were unitary with the motor. That gave weight distribution way ahead of its time. All this sat in a tubular space-frame chassis. It was hitched up to deDion axles. The fuel tanks flanked the driver. Again, that presaged later developments in F1. The catalyst for the T251 was Jacques Bolore. He had recently married into the Bugatti family. It was not long before he was influencing the way the company was run. Since founder Ettore Bugatti's death - in 1947 - racing had been put on hold by the firm. But Bolore had a vision of Bugatti back in F1. Enter the T251! It was unveiled in late '55 - at an airfield, close to Bugatti's Molsheim base. It was there, too, that the car was first put through its paces - though not until March of the following year. Tester was Maurice Trintignant. The T251 was subsequently entered for Reims' French GP. But not without concerns - for testing had revealed serious flaws! Both designer Columbo - and driver Trintignant - were adamant that further development was required. But Bolore's mind was made up. He wanted to go racing - and it was he who now held the reins of power! Two 251s subsequently went to Reims. In the event, it was all a bit of an anti-climax. The T251's avant-garde weight distribution provided top-notch traction - especially out of slower corners. High-speed handling, though, was hairy! The 251 qualified 18th out of 20 starters. Ironically, it was to retire after 18 laps! The pretext given was that the throttle was sticking ... but it was clear that the T251 was way off the pace. And with Bugatti coffers depleted, there was no money for more development, anyway. All in all, then, a sad end to Bugatti's return to top-flight racing. The T251 project rather fizzled out in a damp squib of under-achievement.